to honor a Council Rock Teacher, Staff Member or Mentor! 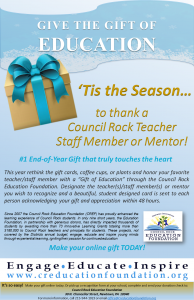 This year rethink the gift cards, coffee cups, or plants and honor your favorite teacher/staff member with a “Gift of Education” through the Council Rock Education Foundation. Designate the teacher(s)/staff member(s) or mentor you wish to recognize and a beautiful, student designed card is sent to each person acknowledging your gift and appreciation within 48 hours. Give a gift that gives all year long!